Fourth Row Center: Film Writings by Jason Bailey: On DVD: "Parks & Recreation- Season Two"
Leslie Knope, the cheerful, big-dreaming, mid-level city employee at the center of the NBC comedy Parks and Recreation, is a deceptively complicated character. At first blush, she comes on as strident and irritating, a type-A, rule-book-reading, power-hungry bureaucrat. But she has neither the killer instinct nor the selfishness to do any harm (or go much of anywhere); she’s got a good heart, and is too hung up on being liked to be a genuine cutthroat. The subtle shadings that make Leslie such a rich and ultimately charming character are the kind of nuances that can only sneak out organically over the course of a TV series; if she were a character in a feature film, she’d be written as a hidebound, clueless schmuck, and probably played that way too. But over the course of a 24-episode season, we can get to know Leslie Knope, and to root for her too. The same goes for the show that surrounds her. 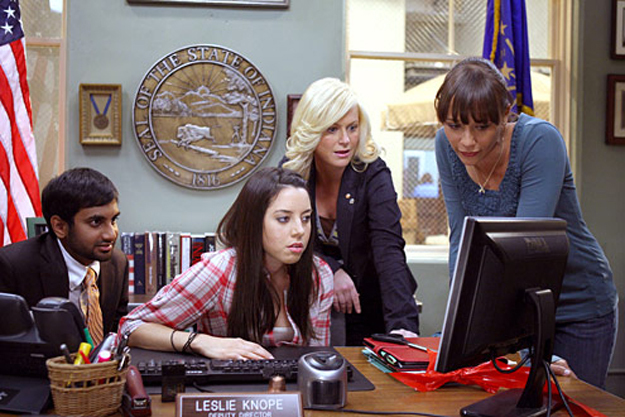 Parks and Rec debuted in spring of 2009 as a six-episode mid-season replacement, just as the U.S. version of The Office had. Greg Daniels, who developed the American adaptation of that series, was the co-creator of this one, and many dismissed Parks and Rec—on the basis of that handful of initial, embryonic episodes—as an Office rip-off. To be fair, there were plenty of common factors: not just the now-commonplace “mockumentary” format (handheld cameras, faux-interview confessionals), but the initial emphasis on the “comedy of awkwardness” and the focus on a clueslessly ineffective central figure (initially, Leslie often came off something like Michael Scott in a skirt). But just as The Office needed those first six episodes to fumble its way out of imitating the original British Office, Parks and Recreation needed those first six episodes to find its own style and voice. When it returned in fall of 2009, it was a faster, stronger, jazzier show, with characters more firmly established and a nifty supporting cast learning each other’s rhythms. At the same time, the freshman show Community was working up its own full head of comic steam; by mid-season, the two rookies were just as good (and occasionally better) than the network standard-bearers that followed them, 30 Rock and The Office. The changing, and sharpening, of Parks and Rec’s game may be a simple matter of settling in; in true “situation comedy” form, the laughs (and occasional pathos) of the show come less out of set-up/punch-line/laugh track school than that of character development and appreciation; the better we know these people, the sooner we’re understanding (and laughing at) their predicaments. But there’s more than that simple formula at work here—the show’s brilliantly interlocking cast may just be, as ?uestlove has posited, “the Wu-Tang of comedy,” in which every member of the group could very well be fronting their own show. Nick Offerman has grown Ron Swanson, the libertarian-leaning Director of the Pawnee Parks and Recreation Department, from a one-note blowhard to a hilariously unpredictable wild card. Aziz Ansari’s social-climbing Tom Haverford could have remained an obnoxious caricature, but Ansari’s finely-tuned characterization peeks, just barely, at the emptiness underneath. 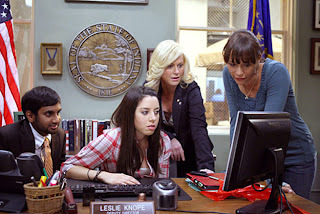 Chris Pratt’s sweet, underachieving, slightly dumb Andy—who would seemingly have little to do after being dumped by Ann (Rashida Jones)—instead becomes a valuable part of the show’s orbit, especially when he begins circling jaded April (Aubrey Plaza, the show’s secret comedy weapon), resulting an unexpected (and unexpectedly sweet) flirtation. The great Louis C.K., in a brief but memorable multi-episode arc as Leslie’s would-be beau, hits on the inventive notion of playing a documentary subject who is not entirely comfortable on-camera, and spins that into a genuine likability without seeming to reach for it. Jones and Paul Schneider often end up playing it straight—they’re the sanest characters on the show—while easily nabbing the kind of deadpan, reactive laughs that often land the hardest. And then there’s Amy Poehler, who is at the center of nearly every scene and is seemingly incapable of taking a false step or sounding a phony note—in spite of the fact that she is so often saying the most ridiculous things. But the obvious brilliance of the cast shouldn’t serve to undersell the skill of the writing; in reviewing the season, this reviewer was shocked to realize the sheer volume of stuff that happens over the course of the year. The ace writing staff and skilled directors (including Daniels, the great Troy Miller, Freaks and Geeks creator Paul Feig, and King of Kong director Seth Gordon) pack plenty of action into each episode, and keep the pace tight (as evidenced by the hours of deleted scenes), while never seeming to rush. The result is a smart, sharp, consistently funny show—one of the best comedies on television. Though NBC was subjected to a public flogging over the debacle that was The Jay Leno Show, they had something to be proud of in the 2009-2010 season, comedy-wise: the two-hour Thursday night block that put together four terrific comedy shows (without a laugh track or studio audience in sight) and let them hum. So, of course, come fall, they broke up the block, exiling Parks and Recreation to “mid-season replacement” status and subbing in, um, Outsourced. (Yay, peacock!) Thankfully, Parks and Rec will be back in January, and the world will be right again. In the meantime, it’s good to have Season Two to hold us over. "Parks and Recreation: Season Two" hits DVD today.